My book, Tarot Spreads — Get the Whole Story, presents a lot of spreads and provides sample readings with them in order to explain them better. There are, of course, countless spreads, and this blog presents quite a few as well. (Some of the spreads on my blog are based on ones in my book.) However, considering the fact that there are hundreds of posts here, I thought I would provide an annotated list here to make it easier for you to find them. Have you ever wondered why your New Year’s resolutions fail? Have you wondered how to make them succeed instead? In my book on Tarot spreads, I introduced one that I call the New Year’s Resolution Spread, and it will help you make successful New Year’s resolutions. I have created a Christmas spread to help you choose your holiday gifts, but it is more than that. It’s about giving of your heart rather than giving material things. The card layout for my Birthday spread was inspired by the ingredients of a birthday cake, and is intended to take a look at the year ahead for the querent. This relationship spread is a modified version of the well-known Past, Present, Future spread. In one blog post, I have presented a couple of spreads for readings to help people solve relationship issues. This is a six card relationship spread that two people in a relationship can do together — in tandem, so to speak. While working on my book, The Soul’s Journey, I also worked on creating spreads that were based on the spiritual material I was gathering for that book. What follows are a few such spreads. This is one of the spreads that I use for Tarot readings of a spiritual nature. In this spread, I have modified an existing one by adding a spiritually-oriented position. I also note that we can modify an existing position in a spread to give it a more spiritual slant. This is a spread that I developed to facilitate accessing spiritually oriented guidance. This spread is based are the ideas that both a positive world view and a sense of purpose help determine our ability to have hope, and the resultant hope can change our lives. This spread is designed to explore the general question of what love and compassion are from a spiritual point of view (versus from a purely relationship POV). My creation of this spread expanded upon an old classic – the simple “Past, Present, Future” spread. The result is a spread intended to facilitate readings to transform your consciousness and create a better life for yourself. This spread is useful in a quest for self-exploration and self-renewal. This spirituality spread, which is from my book, The Soul’s Journey, was inspired by the fact that incorporating appreciation, atonement, and forgiveness in our relationships and in our everyday lives is an important step along a journey of awakening. Here are some other spreads that don’t fall into any of the above categories. 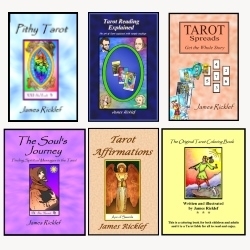 My books Tarot Spreads — Get the Whole Story, and Tarot Reading Explained both feature spreads to help people make decisions, since this is a common issue for people requesting a reading. Here is another Decision Spread. This is yet another Decision Spread. This four card spread is will help you get better results in your life. This spread was inspired by an article about the top five life lessons shared by people ages 65 to 104. To create this spread, I used a technique wherein the positions of the spread are inspired by an image – in this case, the Emperor card from the Rider Waite Smith deck. This process is described in my Tarot Spreads book (where I used a different Tarot card as an example), and I provide a brief overview of it on my blog post. The Emperor Spread is a rather general one that is useful for a wide variety of readings. Organic spreads are ones that grow and develop during the course of a reading in order to suit its dynamic needs. On this blog post I provide an example of doing that. Note that if you’re going to use this technique, it is important that you know how to create spreads. If this is a topic you want to explore, I highly recommend my book, Tarot Spreads: Get the Whole Story. So there you have it: a lot of new Tarot spreads to explore. I hope they give you some great readings! I discuss this technique at length in my Tarot Spreads book, where I use a different quote to create another spread. « What does the Ace of Swords mean?